Calloway was actually a writing challenge for a group I’ve joined online. The objective was to write a story of gay fiction that could or could not have a romance plot. I didn’t make the deadline for submission, but I liked the guidelines. No cops, firefighters, paramedics, military, jocks, nerds, vampires, werewolves, shifters, or impregnations. With such restrictions, it really made me have to think outside the box and I didn’t mind it at all. I was thinking about the stories I’ve read that feature LGBTQIA+ characters, and couldn’t come up with something that appealed to me. Then it hit me to expand my thinking to the best stories I’ve read. Why not just replace the main character with a gay protagonist? But then I hit another problem, would there be a romance subplot and if so how do I add it to the story? I wrote up a few things but nothing worked out. There was one about a fishing boat crew, train engineers, and such. But I was speaking to my big brother and he asked was any of the scenarios or plots something I would do. When I said no, he asked why don’t I try something that I’ve done or would do. Being in college at the time, I started to think of the careers that people are taking and even my own job working in a kitchen. Those weren’t particularly glamourous, so I expanded it to a small business, that would become a larger family business. I loved that idea because it wasn’t so far-fetched fantastic. From there, things came fairly quickly. If it’s a family business, then family drama is a given. And I definitely know about family drama. Coming up with the Cain family was fun, the names are of people I know and getting their interactions right took time. That time also gave me many ideas. The story was different, so why not go even more so. The last problem I had was the setting. If I was going to have a gay male protagonist, how do I address the obvious elephant in the room that he lives in the deep south, a place in America that at times still has a problem with LGBTQIA+ individuals. I knew that I wanted his family to love and accept him unconditionally to the point of them not caring, and that was the key. 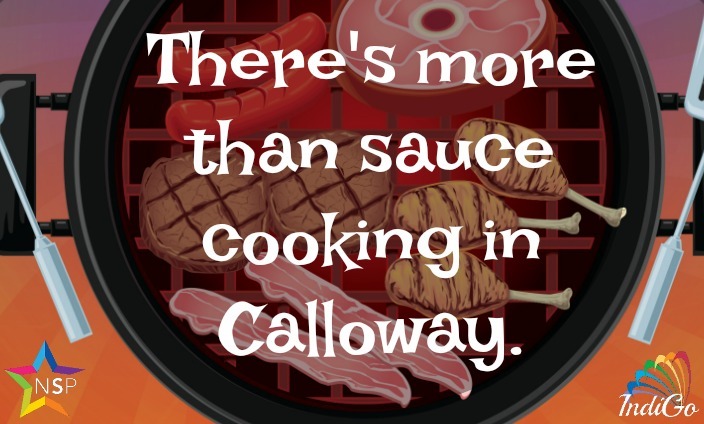 You may notice that no one ever mentions anyone’s sexuality in Calloway. By default, the story is set in another world since Calloway is a fictional town, but I also kept it virtually identical to our own. I was concerned that it may be mistaken for trying to side step important issues, but every beta reader loved that they could be immersed in the story. I personally am very fortunate to have a family that accepts me completely, and I was out to them before I was even 14 years old because, well my parents confronted me about it and wanted to make sure I knew there wasn’t anything wrong with me. I wanted that to come through in this story, and hopefully it did. Tagged Book Blitz!, Calloway, Excerpt, Giveaway, Guest Post, IndiGo Marketing & Design, Promo, Rafflecopter, Thad J.